How skeletal tracking works and how you can choose what skeletons to track using tracking IDs. How to use the SkeletonViewer to visualize all joints returned by Kinect including whether those joints are not tracked. 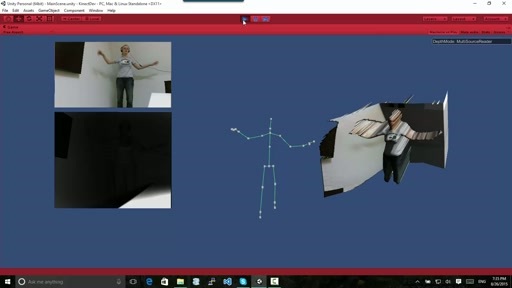 Is it possible for kinect windows device to capture gestures of a person when sited down behind a desk? 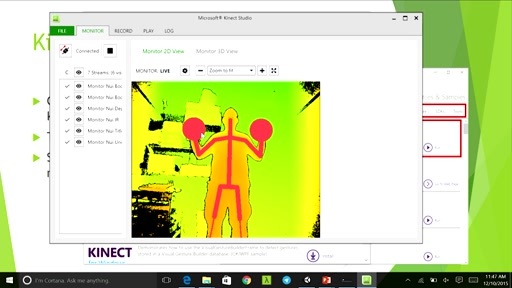 I understood that the currently available kinect device is not capable of partial skeleton detection. Is that true? from your sample video it seem that skeleton is clipped (that is a partial tracking), nevertheless you always stand up to be tracked. in debug mode, scaledJointType is a HipCenter, not what I want. And trackingState fixed to 'NotTracked' mode.I don`t know what I have to do.please help. Thanks. @myChan:Try adding a break point only when Tracking State = Tracked. I don't understand how the scaledJoint value could ever be set to a HipJoint if there is no TrackingState. Can you post the code that you're using and we'll see if we can't figure out what's going on? @Dan:Hmm. That`s strange. I didn`t modifiy the sample code. I re-downloaded it, but the same problem occured in that situation.Joint Information is right,but scaledjoint is still incorrect..
anyways. here is the code. only one that I modifiy is ScaledPosition Section. @myChan: Just so I understand the problem, when you put a breakpoint in the ScalePosition method, and before you execute the method, the value of Joint is a HipCenter and it's position is not tracked? @Dan:Definitely. Can you explain why this happens? I can`t find the reason.. Thanks! I solve the problem. Thanks for your help! So I followed your tutorial and cannot get the ScaleTo method to recognize for the Joint. Any idea why? I went and downloaded the sample code, but still cannot get it to work. What did you do myChan? hi...i just wondering how doing the hover button with SDK V1? @Blas: Maybe I think, You should check the GetCameraPoint() method. To scale the position of skeleton, CameraPosition() method must be commented. And After you uncomment the ScaledPosition() method in sensor_AllFrameReady event, You can get a right result! hmm...but how about the hover a button to select/click a target? I tried that but nothing. I have your code exactly, its just the one line in line 180 where you call the joint.ScaleTo(1280, 720) method. It isn't recognizing the ScaleTo method even though I just downloaded this: http://c4fkinect.codeplex.com/ But its still not working for me. Where is the ScaleTo method in Joint? @Blas: I think ScaleTo() is the built-in function of the joint.After you uncomment the line 180, you should comment the CameraPosition() (line 118~121),then you can get a right answer. Maybe CameraPosition() has a high priority than ScaledPosition(), I think..
@kendrick0772: Maybe You can get a inspration in here. Check this out. @myChan Well I can't do that...like I said I get an error with the scaleTo Method that it does not exist. Where is it? Where can I find it? Why does that error not show up in his code? Never mind it works fine now! Are there any sample code in C++ to get the X, Y, Z coordinate of the joints? 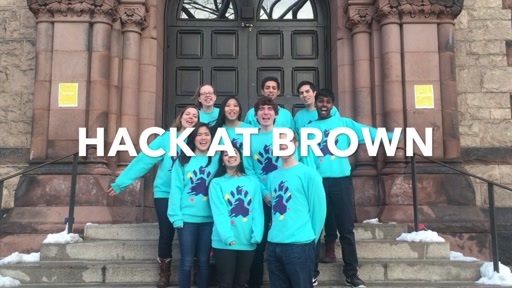 If I wanted to add images to the Camera and interact with them, how would I be able to detect if my either hands are touching the image? I tried using the PointToScreen method but I do not think this will work. Any ideas? I have the same question as Mattia De Rosa. 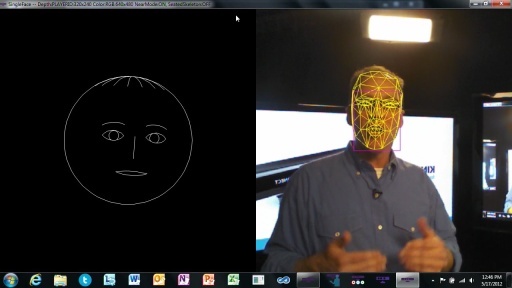 "Is it possible for kinect windows device to capture gestures of a person when sited down behind a desk? I understood that the currently available kinect device is not capable of partial skeleton detection. Is that true? from your sample video it seem that skeleton is clipped (that is a partial tracking), nevertheless you always stand up to be tracked. Just to summarize is it possible to capture the hand gestures of a person seated behind a desk? thanks for the reply!!! wonderful! hmmm, i got questions to ask! in the latest sdk v1. how to make the cursor move no matter u are using left/right hand? any sample code for that? Using sensor.SkeletonStream.Enable() (no 'smoothing' parameters then) I still have a significative delay. Can I further improve the response? Or maybe it is a problem with my not-so-efficient laptop? Thanks a lot for your support with these tutorials, they are helpful. I trying to generate an aplication but I need to detect the pixel color, do you know how to do that?. For my application I would really like to be able to scale the joint distance but I can't get the ScaleTo method to recognize for the Joint. ScaleTo is not recognized. Is it because I'm missing a library or something of the sort? Also coming is what we call "seated" or "10-joint" skeletal tracking, which provides the capability to track the head, neck and arms of either a seated or standing user. What is extra exciting to me about this functionality is that it will work in both default and near mode! Yes, check out the C++ Skeletal Viewer example that ships in the SDK. You an filter by language and select just C++ samples in the Kinect for Windows SDK Sample Browser app that ships with the SDK. Hmm, for a baseline, can you try running the Kinect Explorer app and seeing what the Frames Per Second (FPS) number you get is? The FPS number is located under the depth camera in that sample. ... I'm trying to generate an aplication but I need to detect the pixel color, do you know how to do that?. You can loop through the colors in that byte array to get the colors for each pixel. At a high level, the array is structured so that the data returned for the first point (0,0) and has four bytes representing the pixel color in the BGR32 format (BGR = Blue, Green, Red, Empty). Is it possible to limit the tracking to just one skeleton, so that when two or more skeletons appear in front of the kinect, only the skeleton which is recognized first is continued to be tracked? Thanks! Is it possible to get the skeleton coordinates given just a depth image. There is no Kinect involved. Yes, the API you'll want to use is SkeletonStream.ChooseSkeletons() which takes one (to track one) or two integers representing which players you want to use for skeletal tracking. The other thing you'll want to do is decide how you want to choose which skeleton you should track. You can do this in a number of ways based on your app, you may need to be a certain distance from the Kinect, so you can get the distance of each player and remove any players not at the correct distance, or you can, similar to Xbox games, have a menu to select the player where the person playing raises their hand over their head and you loop through setting the tracked skeletons (check 1 & 2, check 3&4, check 5&6) and see which of the six skeletons have their hand joint above their head joint. The current API will always return an array of six skeletons, even if there is only one person in the room. You will know which of the six is an actual person by checking the TrackingState of the skeleton. Sir this tutotial is really very helpful, what i wanted to ask is that how we can perform the button click function using the Hand Gesture. Can you plz upload a tutorial on how to use this control in an app? 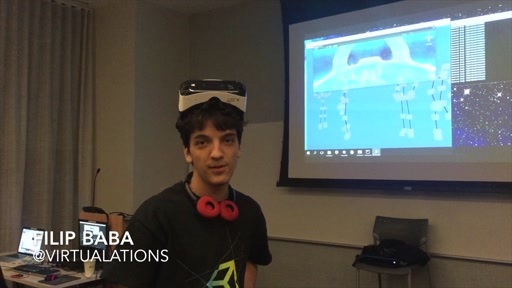 Does anyone know how what is the maximum distance a person could be from kinect and still be picked by skeleton tracking? and 0.5 meters to 3 meters for the kinect for windows who has near mode enable. @Myra: Try using Ray Chambers video to guide you in the process. It helped me. Have you ever tried making this app using navigation windows in wpf? I tried but for some reason it doesn't work. i have an important question. I'm a student, and we work this time on a Kinect projekt. 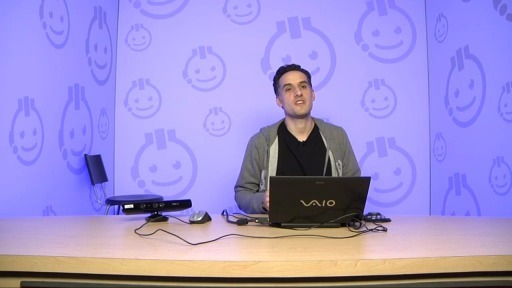 Your Videos are great and give a good introduction in programing with kinect. I have a problem in the Skeleton Tracking Projekt. If switch the ColorViewer to autosize and maximize the Window, the Elipse on Hands are not longer on the right Position. Can you tell me how i make my app resizable? Hi, I've tried the demo you provide, and I've got problems with the 'skelate tracking". actually the exemple is not working well, I've even tried to copy the complete code, but it still not working. and by checking variable using brake point, ( first, allSkeletons, ...) it appears skeletons are not tracked. Does anyone no the reason why or has n idea ? Seems that I keep forgeting to add the windows loaded even in the window.. I want to track Hip Joints for 6 skeletons. Can anyone help with the code? Hey, I need a bit of help here. Bear with me, I'm very new to C#. The video kind of jumps straight to the code. I just have a problem setting the ellipses. They don't move. I don't know how to bind them properly. How do you get the ellipses to move after you create them?? Thanks a lot for that awesome Tutorial. I have been trying to apply it in my project but i kept receiving this warning which says "Warning: An ImageFrame instance was not Disposed." I am sure that i disposed all the frames that I created. Can you please help ?! I am a student from Tsing Hua University, China. I've been following you tutorial these days. The first four sections went great. However, when I came to the fifth one, which is the Skeletal Tracking Fundamentals, a problem emerged. I believe I had exactly followed your steps and codes showed in the video, but it just didn't work out. I mean the Image control and the two ellipses I had set on the MainWindow didn't follow my joints, that is my head and two hands as you have specified in the video. Here is my code as you may want to check it out. I was wondering if you could help me a little bit. And I would be so grateful. @Adila & @kinjad: I had a similar problem and it was resolved by removing all 'HorizontalAlignment' and 'VerticalAlignment' properties from the elements you are wanting to move. The Bold part on the above line is where the error is highlighted in my code. Can you help me with this, coz i'm kinda stuck with this for days now.. The reason this is null is because there is *no* skeleton (or null skeleton) when the app first starts up. What you want to do is do nothing if there is no skeleton. 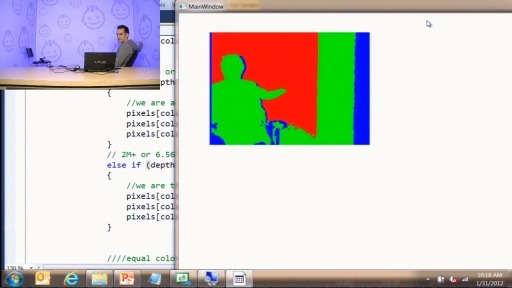 can any1 mail me or upload the code(c++ in opencv) for gesture recognition using kinect. It would be possible with the tool box do a mob cauter or a crwd couter? associate face images to a square? Would not use the skeleton, but as you associate the image to the face .. and an algorithm to count the squares! Can you help me implement this? I am trying to control a Drone with the kinect. Do i use the skeleton and depth data for that? I am running out of time . please help. The sample code runs perfectly on my computer; however, when exiting the application, an exception happened on line 177 of KinectSkeletonViewer.xaml.cs where the line reads "ColorImagePoint colorPoint = depthFrame.MapToColorImagePoint(depthPoint.X, depthPoint.Y, this.Kinect.ColorStream.Format);". This API has returned an exception from an HRESULT: 0x80070015". You may want to try the latest release of Kinect (1.5.2) as I think this should be fixed. Awesome! Thanks for the video. I've try out the skeleton tracking (full body) and it work well for the standing/vertical position. However, when I try to do a bit of the exercise in which requires lying down and the skeleton in more of a horizontal position the tracking does not work well. May I check with you if the there is anyway to work around this problem ? or would there be a release in the future of the sdk that would incorporate this lying down/horizontal skeleton tracking features. 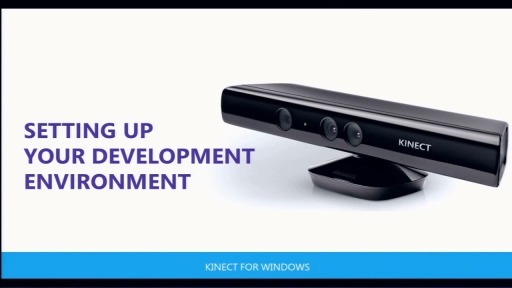 @Dan: but I go here https://www.microsoft.com/en-us/kinectforwindows/Develop/Developer-Downloads.aspx and the SDK is still 1.5, the toolkit is the one that have been updated. I'm getting the same "InvalidOperationException was unhandled This API has returned an exception from an HRESULT: 0x80070015" and don't really know what to do, cause it's related to the SkeletonViewer. If I delete that viewer from the mainWindow.xaml, that message doesn't appear (not even at closing the window), but that means that I cannot render the Skeletons on Screen automatically. I've built the demo like that above. But when I've put ellipses for joints on canvas and run the project, ellipses did't appeared in front of color picture. Instead they are in background - not visible. What I did wrong? I have a solution to the "InvalidOperationException was unhandled This API has returned an exception from an HRESULT: 0x80070015" and I figured I would post for any future readers. Once I updated these operations to the revised functions, I no longer receive the error. Hope this helps! I used the QuickStart sample code for skeletal tracking and have the latest SDK, but I dont understand why the headImage does not follow my movements. The ellipses follow my hand motions. Why is it when I run it, I can get the ellipses to work, but the headImage automatically goes to the top left corner of the window and doesn't follow my head motions? I was partially able to solve the problem. All 3 joints in the code are now tracking and objects moving, but I changed the headImage image object to an ellipse object in the .xaml window. The question now is why the headImage image object did not work but the ellipse object works. I really like your videos, they have been very helpful to me. I want to save a movement (x, y, z) and then compare this with another movement (x, y, z) in real time, the idea is that the user will try to mimic the movement saved, and the system makes a calculation to find out how similar (0% ~ 100%) the motions are. My current problem is that the skeleton from the recorded movement is different of the skeleton that is trying to mimic the movement, I'm trying to work with the idea of ​​a standardized skeleton you have any suggestions on how I can record and compare data in a standardized way? I tried to follow the video. Everything compiles, but the ellipses and image are not well mapped in the window. I checked CameraPosition and I do have the same calculation for the "SetLeft" and "SetTop". Also, I am unable to download the sample code. Hi Channel 9, this is really a beautiful series that you put up. Hi I was just wondering if you have your videos transcribed somewhere for download? I really appreciate the tips I'm learning but English is not my native language, so sometimes the presenter speak a bit too fast for me to follow. Would really appreciate a text version of these tutorials. please tell me what excatly represent in the body? 2- for depth data, it gives only distance between object and kinect, if i have object 3d like cube , for points in the z-axis it also retuen this points or just points in front of kinect? 3- if i need to track points that doesnt exist in the available joints , can i add other joints/points or not? this is the line that it say it obsolete. anyone know how to fix this problem. 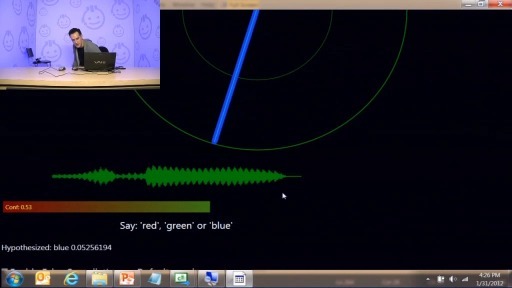 the line "using Microsoft.Kinect;" has a red line under Kinect. the program is runing, but a build error is showing before. anyone knows how can I make this red line under the Kinect to disapear? how can i do when Hover button by hand skeleton and the command load image to tracking spine skeleton in c#? One thing: how to set the image with transparent background? I tried to do so, but the backgroud is always white. Really helpful tutorial. Helps me a lot. But, I am stuck in a very basic problem. How can I record RGB and depth video. I tried to save RGB and depth as .png files (as shown in colorBasics example, writing one .png color image) in each event handler method. But, it generates 6fps. How can I record RGB and depth video in 30fps speed? Do I need to use multi-threading? I don't know how to use it. Your help regarding this will be highly appreciated and very helpful for the beginners. Also, the RGB and depth images are not synchronous when I tried to write in this way. Means, for all RGB images, there may not be a similar depth image. @Adam Victor See my post above. I believe that is the fix you are looking for. Thank you for all the tutorials, are very useful. I´m doing an school Project and i need to recognize some patterns like rectangles, circles and then know at what depht they are. Do you have some example of this or somewhere can i find something like this?. Thank you again for your tutorials, keep working like that. @SFMID: If you are looking to analyze photos and do things like shape or object recognition, check out OpenCV - http://opencv.org/. Please, Could you update this sample for the latest SDK.. It's really great and it's helping a lot in my graduation project, but now it's giving me many warnings with new SDK. Could you please help? All the same error "The Name dose not exist for the current context"
The thing I do to the sample is to change the reference Microsoft.Kinect to a new version 1.7.0.0.Then I change KinectSkeletonViewer.xaml.cs as Mason told before.But I still get something problems. Firstly, when I close the MainWindow by clicking the X at the righttop cornor,the image stop moving. However, the MainWindow is still there and can't be closed. In Windows Task Manager,it shows that the MainWindow is not responding. Only after I stop debugging, the window will be closed. So what's wrong with this? And what should I do? 'Microsoft.Kinect.DepthImageFrame.MapFromSkeletonPoint(Microsoft.Kinect.SkeletonPoint)' is obsolete: '"This method is replaced by Microsoft.Kinect.CoordinateMapper.MapSkeletonPointToDepthPoint"
I am new to C# so I don't know how to change that.However the program still goes well with the warning. Can any one please let me know were can i get the code for skeleton for this video . How can I save skeleton images as bit map or jpg in a file ,I would request you guys to help me in this , its very urgent for me . I am currently having a project that needs to make use of the live streaming and the skeleton tracking together any idea how to do it ? C# PROGRAMMING . The download link of the source files is dead. @thanapon: I am facing same issue.Page not found is coming. Please find the code . It is working . I need to make some specif changes. In this code I need to address some problems. // the only problem is it is taking one output in file , I want the file to be written continuously. looking for selection code gesture:hand move towards the kinect and item should be selected. i cant download the sample example.